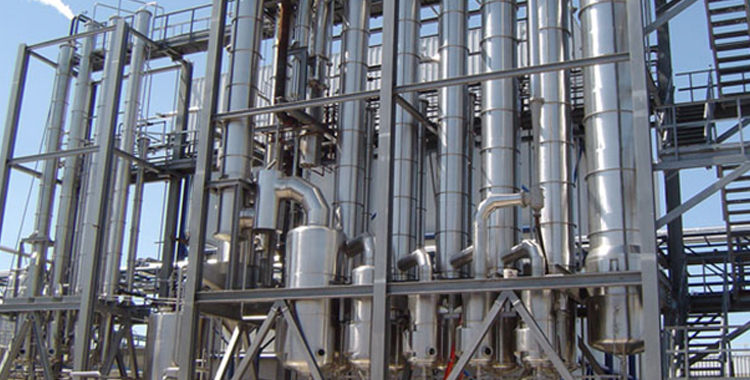 Chem Process’ Rising Film Evaporators operate on a “Thermo-Siphon” principle. Feed product enters the bottom of the heating tubes and as it heats, steam begins to form. The upward force of this steam produced during the boiling causes liquid and vapors to flow upwards in parallel flow. At the same time the production of vapor increases and the product is pressed as a thin film on the walls of the tubes, and the liquid rises upwards. This co-current upward movement against gravity has the beneficial effect of creating a high degree of turbulence in the liquid. This is advantageous during evaporation of highly viscous products and products that have a tendency to foul the heating surfaces. Usually there must be a rather high temperature difference between the heating and boiling sides of this type of evaporator. Otherwise the energy of the vapor flow is not sufficient to convey the liquid and to produce the rising film.